The complete cloud management platform. Now with automatic acceleration for websites. OnApp Cloud takes the complexity out of building, managing and selling cloud infrastructure. 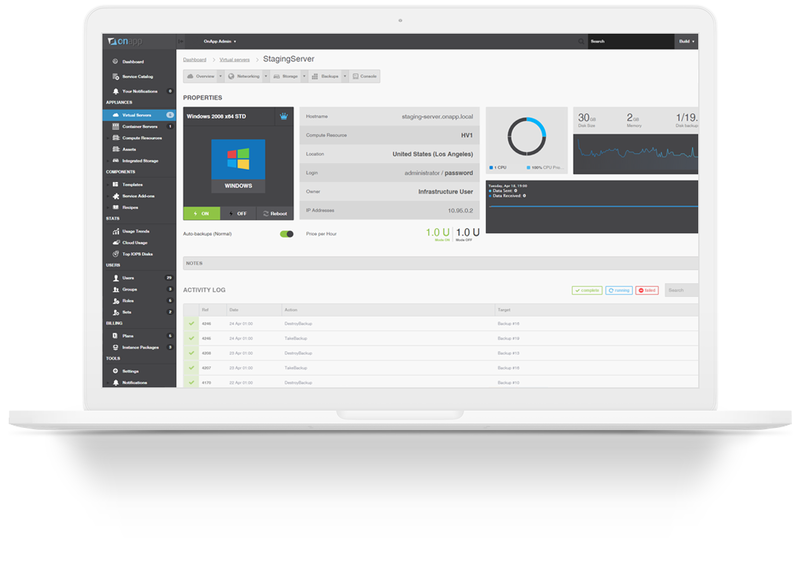 It’s the complete cloud management solution for service providers. OnApp software powers private, public and hybrid cloud services for thousands of businesses, hundreds of thousands of users and millions of virtual servers – including an estimated 1 in 3 of the world’s public clouds. Now, OnApp Cloud automatically accelerates web applications on virtual servers by compressing and optimizing their content, and distributing it automatically to a global CDN – free of charge. OnApp is quick to deploy and easy to configure – it’s an end-to-end solution with a full suite of orchestration, provisioning, management, security, metering and billing tools built in. If you have infrastructure in place, your OnApp cloud can be deployed in hours: no need for months of development and integration work. You can also get OnApp On Demand, as a fully managed service. OnApp brings multiple clouds and multiple virtualization types into one easy-to-manage environment. It provides a single abstraction and management layer for distributed private and public cloud infrastructure. OnApp’s intuitive UI simplifies and streamlines your cloud, and enables workloads to be provisioned and migrated fluidly to the cloud infrastructure that suits them best. OnApp automates metering and billing as well as cloud orchestration and management. You can price and bill for cloud services in any way you want, and sell the full range of IaaS products. With support for many different billing models, it’s easy to tailor your cloud offering to the needs of different customers – building your own value-add services into your cloud propositions. OnApp clouds feature our patented Accelerator technology, which automatically optimizes and distributes content for web applications. Web apps run faster on OnApp clouds. Acceleration is just one of the many ways OnApp helps you differentiate your cloud – along with applications, your own services, and a broad range of IaaS capabilities available through one platform.